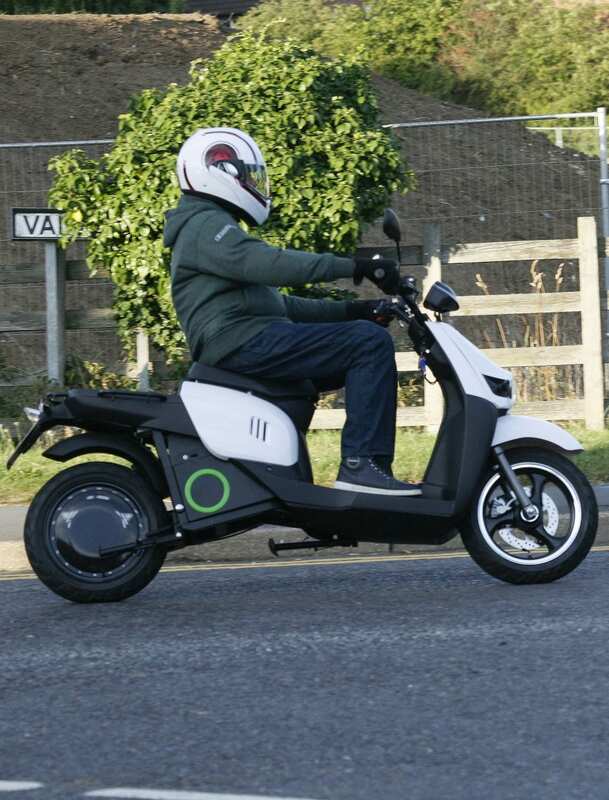 Electric scooters are like Marmite; love or hate them, they’re fast becoming a regular sight on our roads. However, many don’t live up to manufacturer’s claims, so the jury’s still out on their viability – but the new Scutum S02 could change that opinion. Most countries have some sort of master plan where electric vehicles are concerned – in the USA, for instance, the Environmental Protection Agency have stated that by 2030 nearly all new cars in California will be required to be zero emission. In the UK, the vehicles on our roads currently account for 22% of our carbon dioxide emissions, and the government is trying to do something about that. So like it or not, many of us are likely to end up owning an electric vehicle of some description in the not-too-distant future. I have to put my hands up and say that I’ve never been a great champion for e-vehicles of any shape or from. I like the concept, but from a personal perspective, the main stumbling block for me has always been range first, and top speed secondary. Even on my relatively short 26 mile commuter hop, some e-bikes have left me a little disappointed – and even stranded on some occasions – not the sort of thing you need when you have to be somewhere for a meeting. However, having spent a couple of weeks riding the S02, my opinion is staring to waiver – could this e-bike be the catalyst for a change of opinion. The S02 comes with a number of battery options ranging from a miserly 1.5kWh version through to 6kWh all singing, all dancing version (which was the one fitted to my test bike). 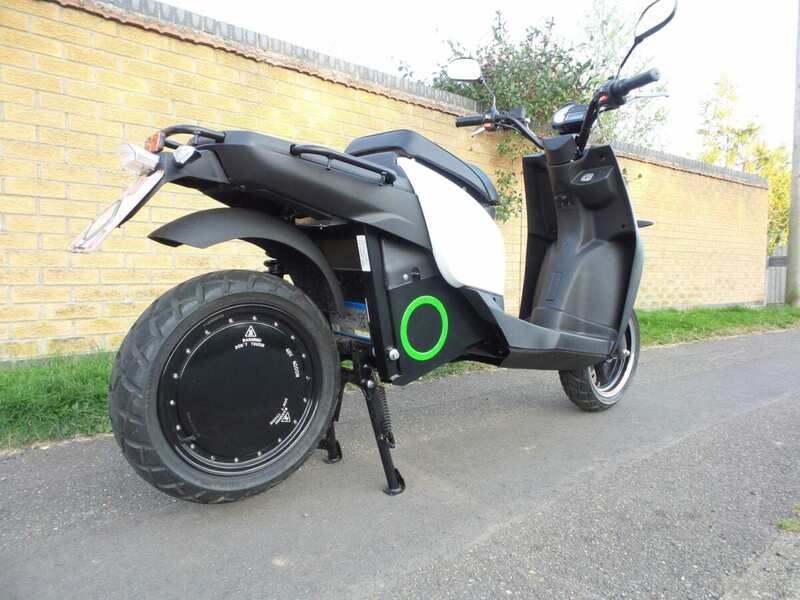 On the face of it, the manufacturer’s claims for the S02 are almost too good to be true; depending on battery choice and the mode you run your scooter in (there are three available – Economy, City and Sport), a claimed range of 62 miles (100kph) on a single charge is claimed, with a top speed of 50mph (80kph) being available. 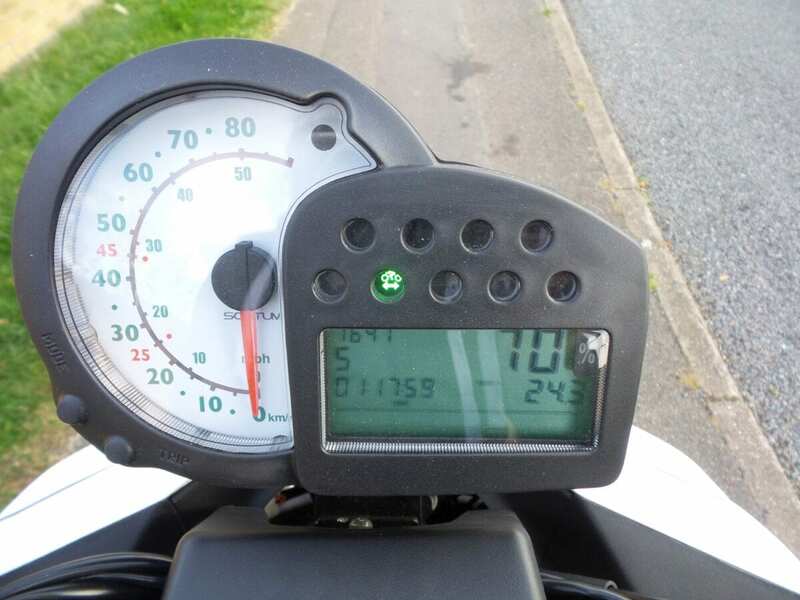 Having briefly tried all three modes, I opted to run the bike in Sport mode (E mode effectively means the bike performs like a moped; C mode is a little better, providing a little more acceleration and top speed). If you’ve never ridden an e-bike before you do have to spend a little time adapting your personal riding style – with an electric vehicle for instance, the power is virtually instant, meaning you get a sudden rush of acceleration; this normally evens out pretty quickly though, so don’t go expecting a high top speed. Handling characteristics are also different, so you have to get used to how you combine braking and acceleration, especially under urban traffic conditions. The handlebars of the S02 were a little wider than a normal scooter and initially riding it felt like I was riding a mountain bike. However, once this was mastered, I was pleasantly surprised at the way it handled in traffic. The acceleration was good enough to see me away from the lights at a much better pace than many conventional 125cc scooters I’ve ridden; handling and manoeuvrability was also surprisingly good with the suspension coping well with rough road surfaces; and the chunky-looking Manlung tyres also provided plenty of grip on the corners. One other thing to mention here is that the bike also comes with a reverse gear. At first I thought this was a bit of a gimmick, but having ridden the bike for a short while, I could see where its’ uses lay. Electric motors come with a varying degree of engine resistance when the bike is being pushed backward (for parking, etc), but having a reverse gear alleviates this (and it always provides a bit of scary fun because the S02 is just as fast in reverse gear as it is forwards)! One thing I wasn’t looking forward to initially was using the bike to commute to work – would the battery charge hold up – would I be holding up traffic whilst riding along what is arguably the busiest A road in Lincolnshire? My first commute was done with a little apprehension, but any doubts I had were quickly cast aside; I buzzed along the undulating roads to work and although the S02 did lose some speed on hills, on the flat with a tail wind, it easily surpassed the manufacturer’s claimed top speed, actually going right off the speedo’s top speed indicator until it eventually hit the spot – I’d guess at around 60pmh (90kph) – I’ve ridden 125cc scooters that are slower than this. With my first major concern about the bike’s abilities allayed, my thoughts turned as to how using the bike at it’s full speed potential would affect the distance I could travel on a charge – again, no worries there, because once I’d established the best way to treat the S02, I could commute on it for virtually two days before a recharge was needed. So has the S02 done anything to change my opinion on e-bikes – well yes, I must say that it has certainly gone a long way to doing that. 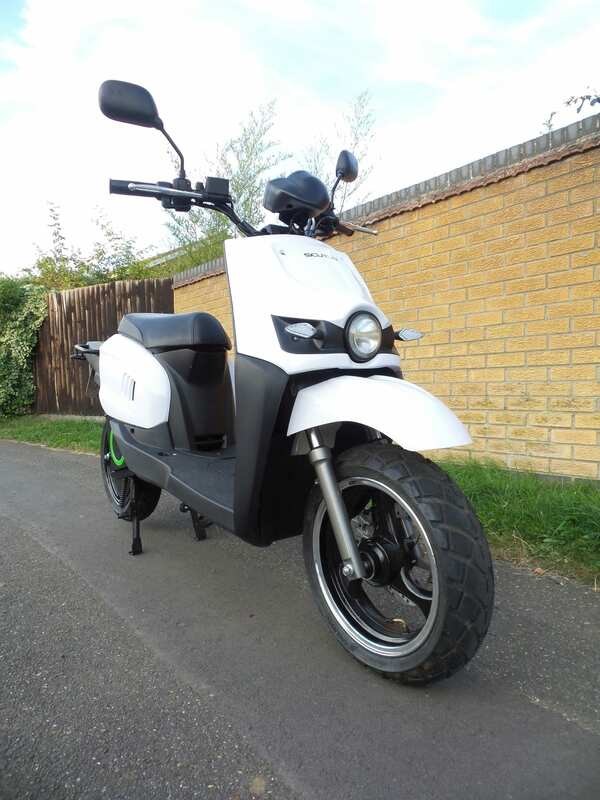 It’s got to be one of the best offerings around at the moment for it’s near £5500 price (bearing in mind that you should get back around 20% of that back now that now that e-bike’s come under the governments OLEV scheme). If there are any disappointments to be found with the S02, it has to be lack of carrying space. 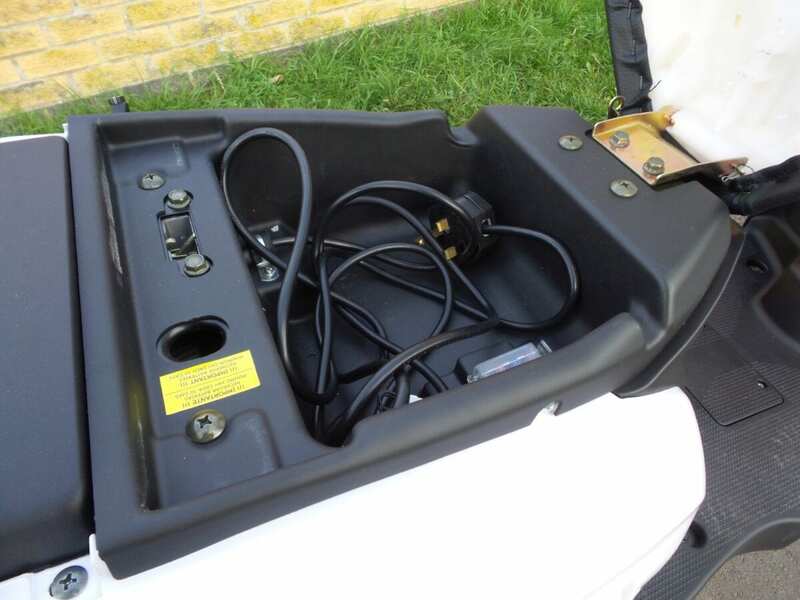 The underseat storage area is taken up by the plug-in battery charging unit, meaning that if you’re lucky, you might just be able to get your gloves in there as well. But if that is of major concern, you could opt for one of the available modular storage options. TO LIKE, OR NOT TO LIKE? The Marmite modular looks of the S02 take some getting used to, but bear in mind that this version is more aimed at inner city use by delivery companies (Amazon Prime are already using them in London and Birmingham). It is the first e-bike from the Scutum range to arrive in the UK and will be followed shortly by the more commuter-focused S01, which claims to have a longer range and higher top speed – can’t wait to see that one. Previous Post:Could you keep it up for this long?